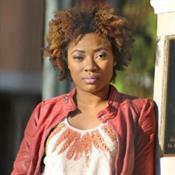 UNCF/Mellon Programs grant recipient Ashanté Reese, PhD interviewed in Epicurious! 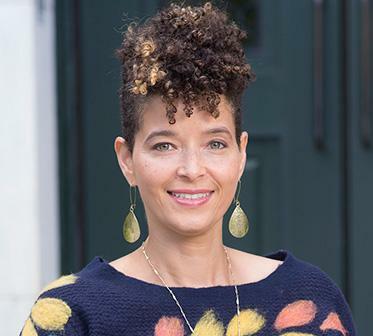 Please follow this link to read the interview Julia Turshen conducted with Dr. Ashanté Reese, Assistant Professor of Anthropology at Spelman College. Please spread the word throughout your networks and apply if appropriate for this exciting offering! UNCF MMUF Ph.D. Shively Jackson Smith moves to Boston University! 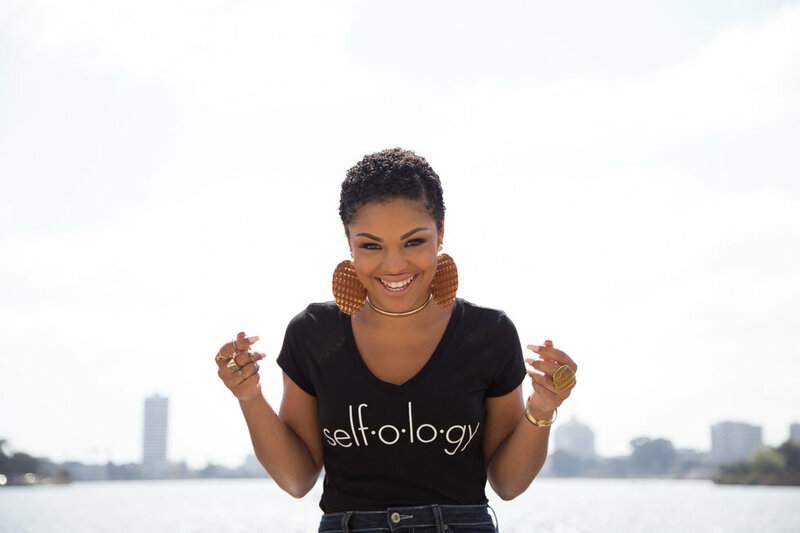 UNCF MMUF Ph.D. Student Ree Botts featured on xoNecole! 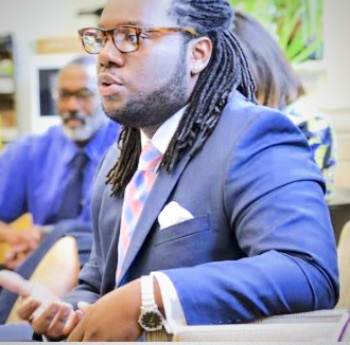 UNCF MMUF Ph.D. Kenton Rambsy publishes #TheJayZMixtape! 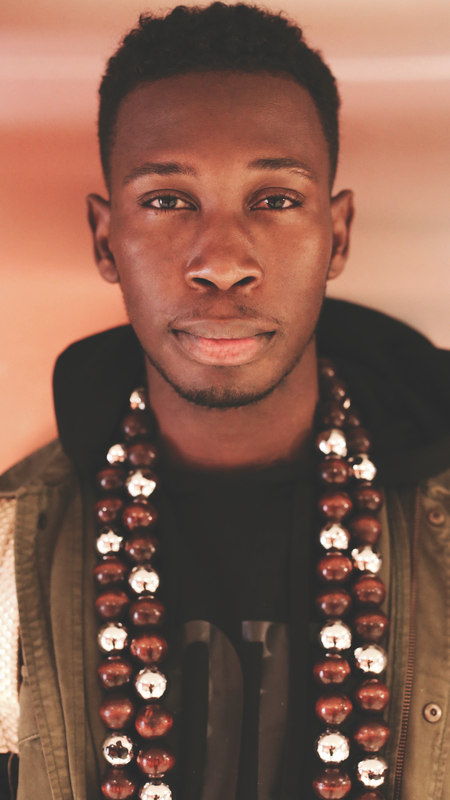 Kenton Rambsy just published #TheJayZMixtape with Publishing Without Walls, a University of Illinois imprint. UNCF MMUF Ph.D. Julius Fleming recognized as a 2018 CIES AD SIG Emerging Scholar! Julius was one of four scholars awarded "whose scholarly and/or artistic cutting-edge contributions of inventive, creative works, emphasizing comparative studies and/or artistic accomplishments (i.e. documentary, visual, or musical) have been impacting positively the educational, economic, and artistic lives of African descendants across the African Diaspora." Julius B. Fleming, Jr. earned a doctorate in English, and a graduate certificate in Africana studies, from the University of Pennsylvania. Specializing in African Diasporic literatures and cultures, he has particular interests in performance studies, visual culture, sound studies, philosophy, medicine, and southern studies—especially where they intersect with race, gender, and sexuality. Professor Fleming is currently completing his first book manuscript, entitled “Technologies of Liberation: Performance and the Art of Black Political Thought.” This project uncovers the centrality of theatrical performance to the cultural and political landscapes of the modern Civil Rights Movement. It argues that black theater, like photography and television, was a vital mode of aesthetic innovation and black political thought. Whether staging performances in the cotton fields of Mississippi, on Broadway, or in Amsterdam, Holland, black artists crafted radical theatrical performances that inflected the political character of U.S. modernity, while revising normative ideologies of race, gender, sexuality, and modernity itself during this historical moment. Professor Fleming is also beginning work on a second book project that traces the historical role of black performance in producing and dismantling the medical industrial complex. Whereas mass incarceration and the prison industrial complex have dominated scholarly and activist discourse, this project makes a case for more evenly attending to the medical industrial complex—both as a critical object of study and a key social justice issue that informs possibilities for being black and human. His work appears in Callaloo, The James Baldwin Review, and The Southern Quarterly, and is forthcoming in American Literary History and Text and Performance Quarterly. Currently serving as an Associate Editor of Callaloo, he has been awarded fellowships from the University of Virginia's Carter G. Woodson Institute, the Mellon Foundation, the Social Science Research Council, and The Stuart A. Rose Manuscript, Archives, and Rare Book Library at Emory University. This week, Dr. Cynthia Neal Spence traveled to Providence, Rhode Island with Spelman undergraduates to visit a social justice program at Sophia Academy. While there, she met with some former UNCF/Mellon fellows currently at Brown University - Dr. Jonathan Collins, Dr. Jamall Calloway, and soon to be doctor Hadiya Sewer. Jonathan and Jamall are Presidential postdoctoral fellows, and Hadiya is doing graduate work in Africana Studies. See below for a forthcoming book project by UNCF/Mellon faculty development grantees! In the majority of science fiction texts and other multimedia formats (i.e. film, television, “SciFi” Conventions, comic book paraphernalia, and graphic novels), the future is usually not inhabited by people of color. Rather an ‘economic’ elite dominates--one that is usually male and reflective of European-descent. Interstellar travel or the creation of dystopian/utopian worlds rarely feature people of color, especially Black women and girls. Moreover, the culturally-specific vantage point of people of color is absence; for example, representations of the world may be largely informed by Western religions/spiritual practices, linguistic codes, and cultural signifiers (such as clothing/costuming, cuisine, music, armament, etc.). Thus, when people of color do appear in the future, as human or humanoid, they may be negatively depicted and quickly destroyed or representative of “color-blind casting, meaning audiences see “black” faces on characters whose perspectives or customs are not defined by--or problematically defined by--an African-Diasporic perspective. We are interested in scholarly analyses of the work of Black women and girls as they dynamically explore and write about the future. We seek commentary on a diverse range of genres (literature, visual art and media) that aspire to right the misrepresentation of or absent representation of Black women/girls. 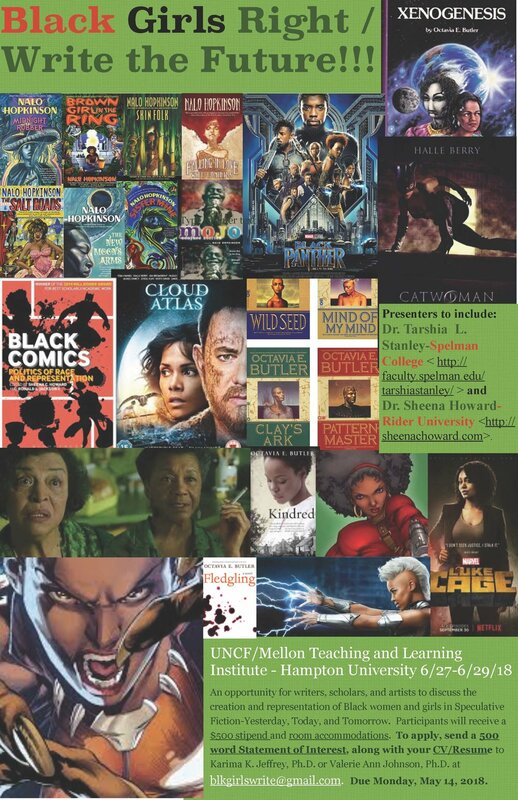 Anticipated texts for consideration might be works that analyze literature by Black women/girls or papers that discuss interpretations of films, television shows, music, media, and/or the visual arts, whether these texts are written, directed, and/or produced by people of color. The crux of your scholarly endeavor should demonstrate how Black women/girls are regarded in these configurations of the future. We are especially interested in concepts around “Futures Studies” that empower representations and/or the voices of Black women/girls, texts that conceive what it means to be “human” in evocative and empowering ways. Discussions of conceptions of the future and/or future encounters between humans or something else--more or less--is also a worthy undertaking, especially if such texts are constructed by Black women/girls who are aspiring to shape the future and/or science fiction texts in truly imaginative ways. 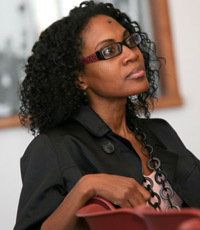 Of special interest is how these creative visions are understood through academic commentary by Black women and girls who offer insights, regarding current challenges in health; sexual violence; economics; state violence; religion; politics; education; and access to resources including food, clean water and air. With these ideas in mind we are soliciting submissions for an edited volume that brings together work centered on the science fiction/speculative imaginings of Black women and girls, especially as they consider our future(s). What do we, as Black women and girls, know of the future? What do we imagine? In speculative fiction, we contemplate future possibilities based on past and present realities; we wonder what kind of humans will we be, if at all, and how we will experience our world. By bringing together writings from Black women and girls, we want to offer readers the opportunity to experience--through scholarly essays and analyses--how Black women and girls view the near and distant future in literary and visual works and through popular culture. We recognize that Black women and girls are indeed producing interesting, incredibly vibrant stories, poetry, graphic novels, art, film, criticism, and academic writings, and we feel that a collected volume commenting on this body of work will serve many audiences. We are looking for material that captures an academic understanding of the ephemeral nature of the human experience from the particular perspective of women and girls of the African Diaspora. This collection will highlight, from a scholarly perspective and from Black women and girls, the rich contribution Black women and girls bring to our contemplation of the future. With their view regarding what can be, we have an opportunity to experience fresh work from voices that are too often unheard. Additional inquiries should also be emailed to blkgirlswrite@gmail.com. 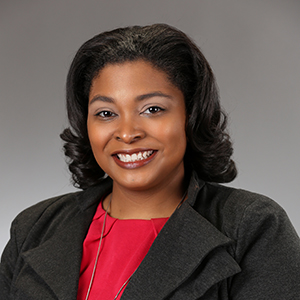 Erica Edwards, PhD (MMUF Spelman '97) named a Radcliffe Fellow! One of our Mellon fellows has recently been named a Radcliffe Fellow - for more details, please see https://www.radcliffe.harvard.edu/people/erica-r-edwards. Congrats, Erica!